Personalize her gift this year. Perfect for the May birthday, a pear-cut emerald (3/8 ct. t.w.) 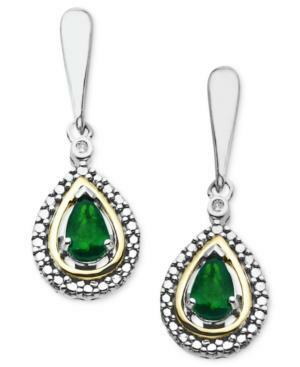 adds a subtle green shimmer to these stunning teardrop earrings. Crafted in 14k gold and sterling silver with a sparkling diamond accent in each pair. Approximate drop: 1 inch.